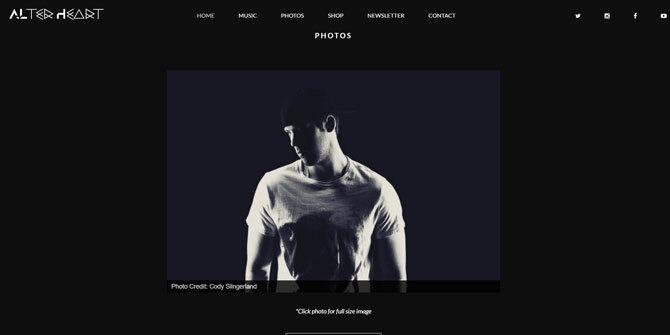 In this post, I’ll how you how to add a photo slider and a photo gallery to your website. First, I’ll start with the photo slider, then move onto the gallery after that. If you’re a new band, the slider may be a better choice to start, since you may not have that many professional photos right away. Then you can implement the gallery later when you start to get some more pics from shows, album releases, etc. Or use both like I do. 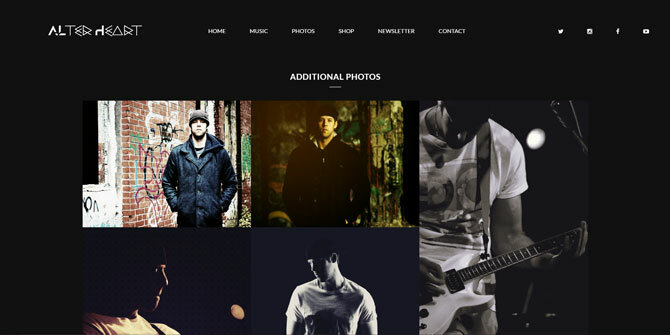 This post is part of a 14-step series on creating a website for your band using WordPress. Click here to go back to the main page. 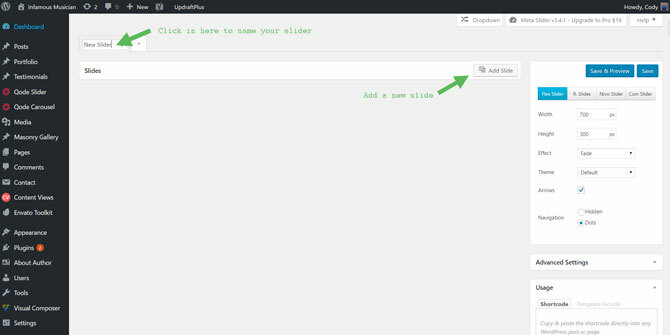 First, I’ll be using the Meta Slider plugin for this tutorial. 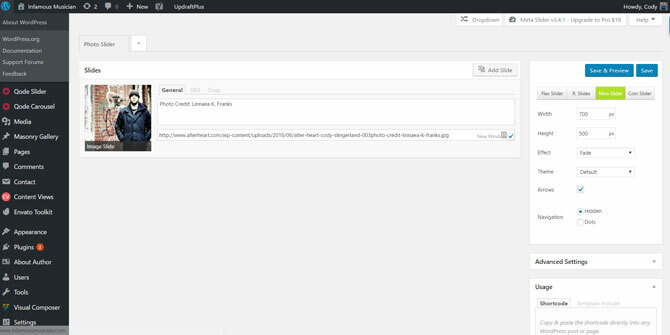 This plugin is not tied to the FWRD Theme (the theme I have been using for this series). 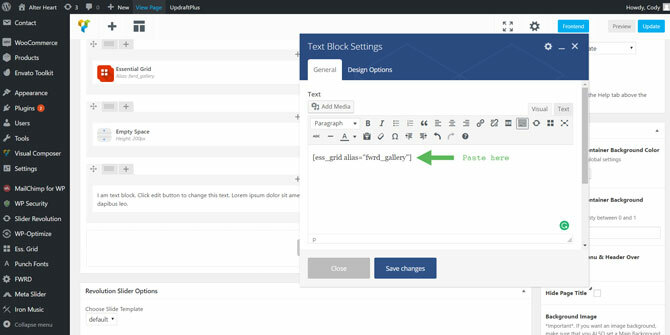 Meaning, if you’re using a different theme, you can still use this plugin. 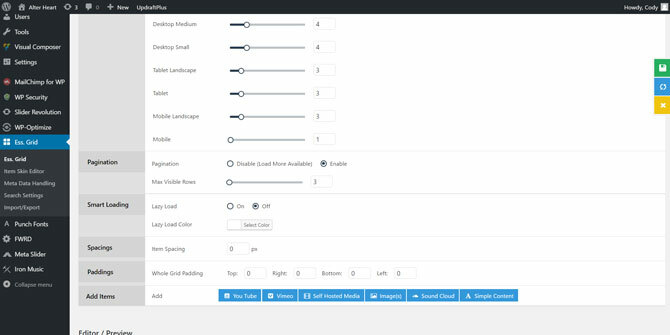 I’ve tried quite a few photo slider plugins. This one seemed to work the best, is easy to use, and hasn’t given me any issues. 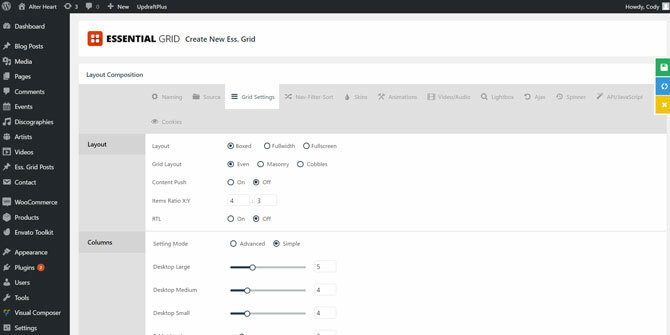 It’s also a free plugin (with the option to upgrade to the full version starting from $19). However, the free version will be enough for now. 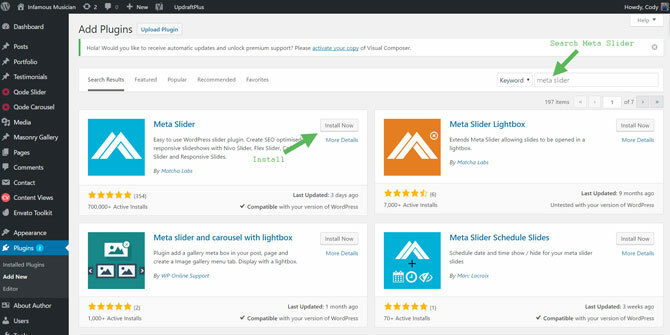 To use the Meta Slider, you’ll first need to install it. 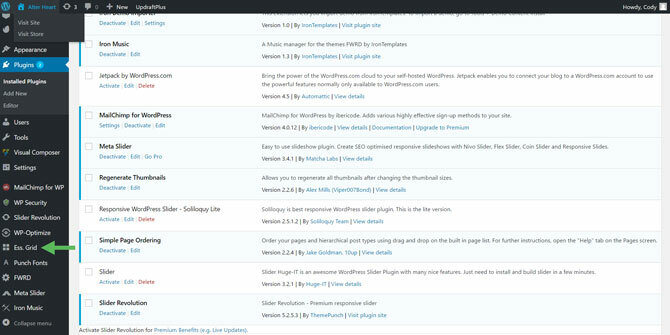 Navigate to the “Plugins” tab located in the WordPress left-hand navigation menu. 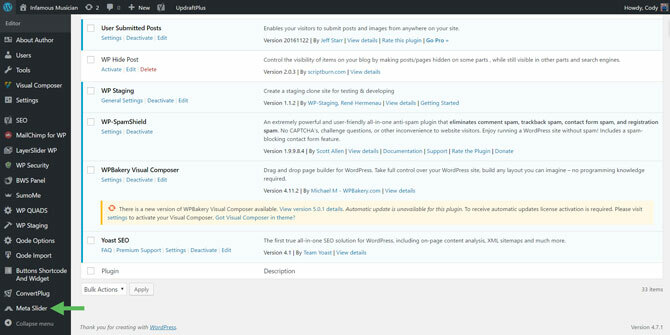 Once you’re on the Plugins page, click “Add New” in the upper left-hand corner. 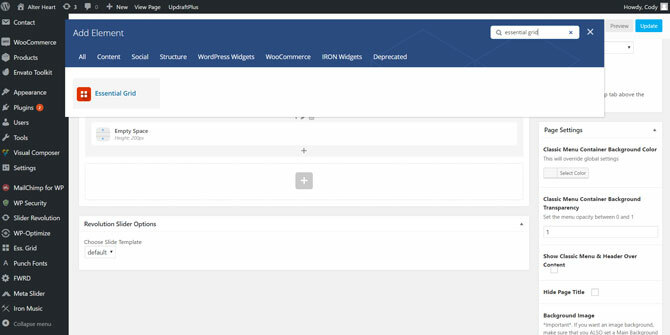 This will bring you to a page with plugins to add to your WordPress website. Now, in the “Caption” box you can add some details for the photo. I’ve chosen to use this box to include the photo credit details. 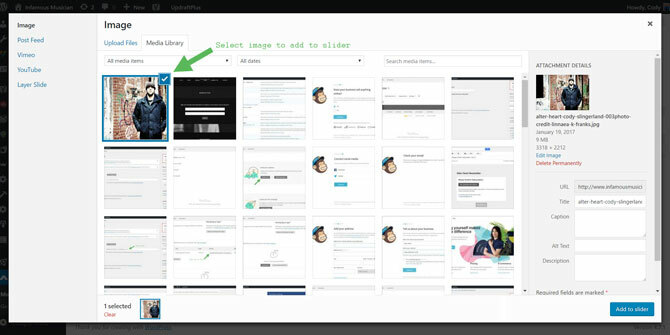 With a slider, visitors can cycle through the images one-by-one. 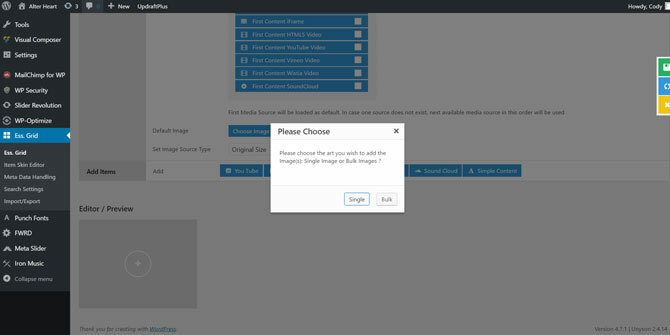 You can also elect to have the slider automatically cycle through images. Either way, I wouldn’t include too many photos. Maybe 10 at most. The idea is to include a few of your best photos. Moving on, you’ll notice a box to the right (best seen in the above image). 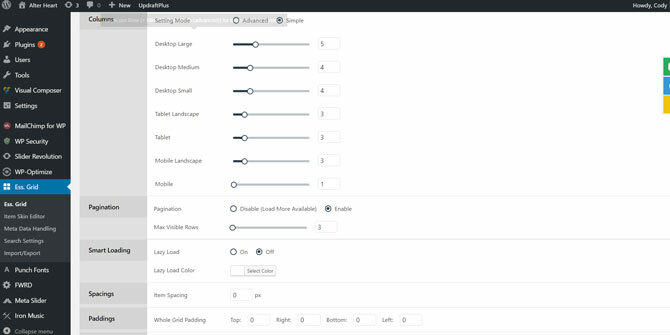 Here is where you can set the options for the slider. 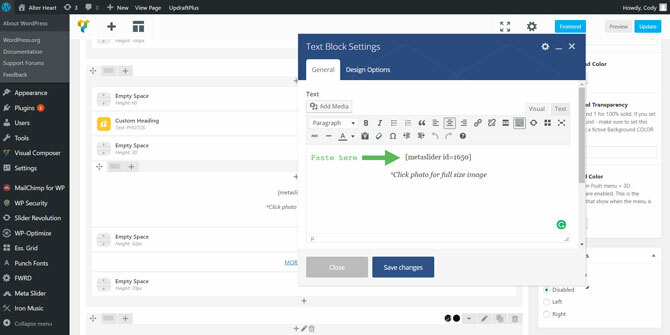 You can change the slider arrow images, whether or not you’d like to cycle through images automatically, how long each image will show, and so on. The above example is a screenshot from my website, www.alterheart.com. 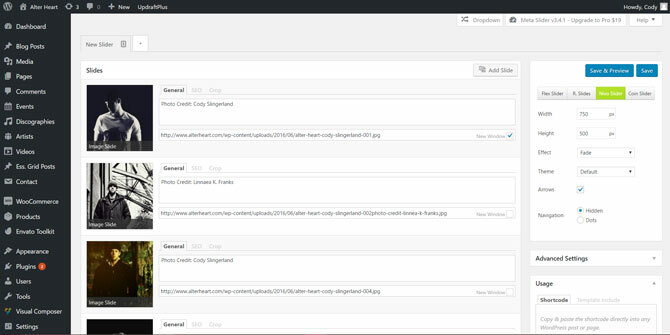 Again, just like there are a ton of photo slider plugins, there are a ton of photo gallery plugins. 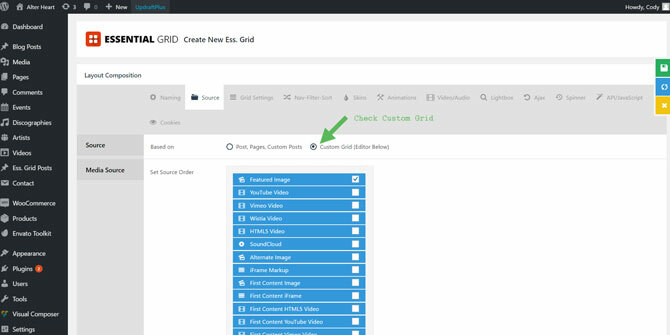 The one I’m using and I’ll be showing you how to set up is the Essential Grid Photo Gallery. This is a paid, premium plugin. You can buy it on CodeCanyon for $26. For that price you get lifetime updates and 6 months of support. While there are free options out there, I’ve found this plugin simply works. Others I’ve tried cause issues or are hard to use. This one is easy to use and simple to set up. Plus, 6 months of support helps. For $26, it’s worth it. 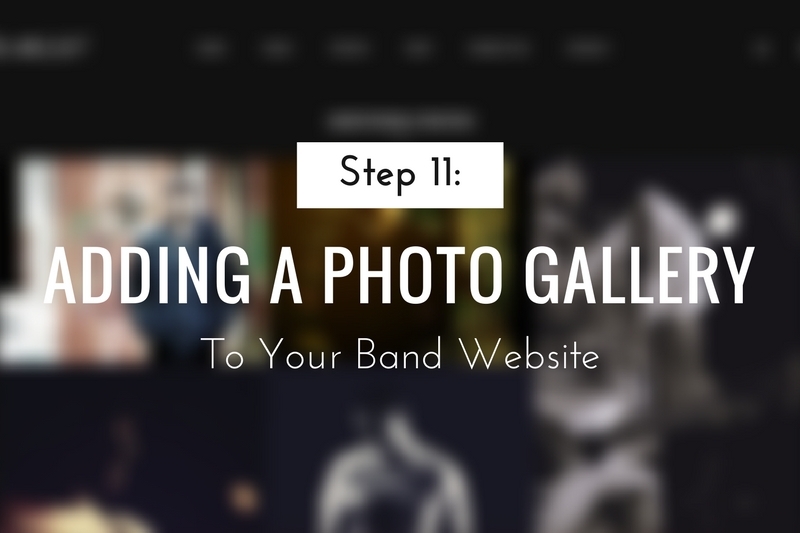 If you’ve been following along in this series on building a band website, and you went with the FWRD theme, then you don’t need to worry about buying it. It already came with the theme. 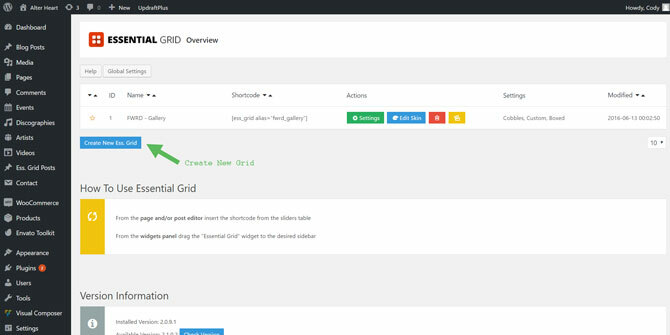 You’ll then be brought to the details page for your new grid (photo gallery). Here is where you can adjust the layout, settings, add images, etc. Click save and move onto the next tab “Source”. 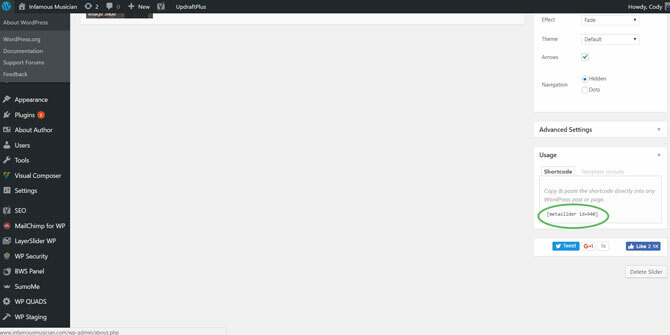 Here you can set where the slider will draw its images from. Next is the “Media Source” row. The first option here is the “Source Order”. With Essential Grid, you can add all sorts of media to display in your gallery like images, videos, SoundCloud files, etc. Under “Source Order” you can decide which to show and in what order. 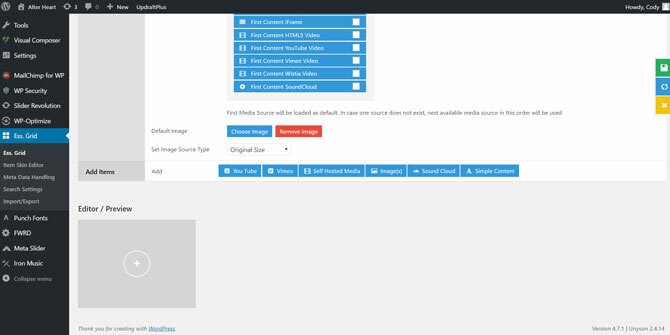 If you want to display images only, simply check the “Featured Images” checkbox. This box will show your media library. 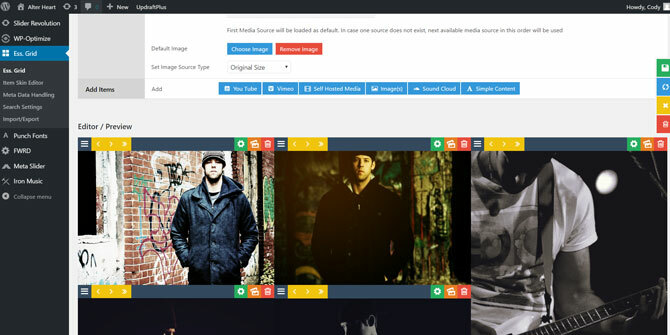 If you’ve already uploaded images to your library you can select the ones you want to add. 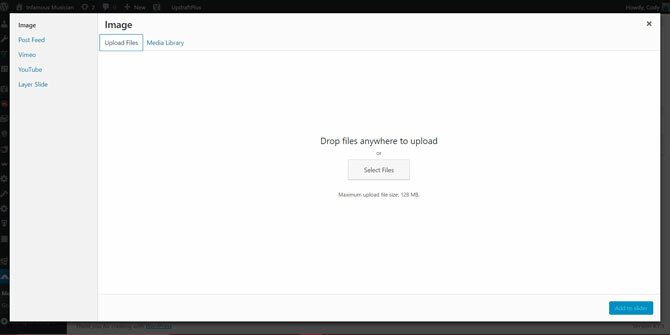 If not, then you can upload them to your library from this box and then select them from your library. 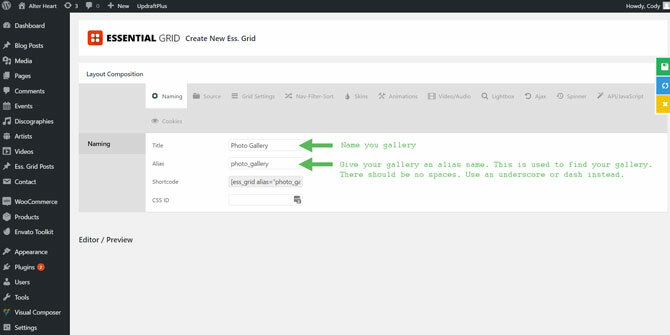 Here you can adjust the settings for the gallery like layout, image ratio, pattern style, etc. I’m not going to go too in-depth on this section. Mess around with the settings until you find a look you like. Or, copy the values in the above and below images to duplicate the look of the gallery on www.alterheart.com (pictured further below). There are more tabs with more options but those first three are the major ones. 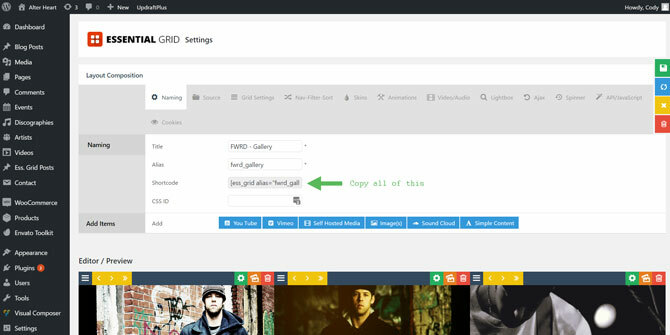 If you want to customize the gallery more you’ll have to mess around with these settings on your own. Or, click here to head back to the main page.